But how would Apple feel about it? 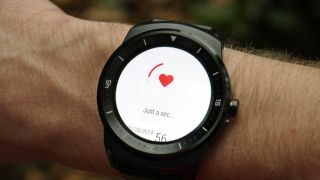 Google's Android Wear OS is enjoying quite the uptake at the moment, appearing on the likes of the Moto 360 and the new LG G Watch R.
But a very intriguing new development could be making the open-source OS compatible with Apple's iOS - as hinted by Android Wear's product manager Jeff Chang. Chang spoke to Huffington Post UK and explained that iOS's large user base is, obviously, quite an attractive target for the team. "We always want as many users as possible to enjoy our experience, so in terms of enabling more people to use Android Wear we're very interested in making that happen," he said. Chang went on to caveat his remarks with the observation that Apple holds all the keys when it comes to iOS and the hardware it runs on. And he points out that Cupertino might not be inclined to share. "It's not always completely up to us, right?" He said. "There are technical constraints, API constraints so we are trying really hard." Apple, famed for its 'walled garden' approach, is sometimes willing to play nice with rival software. Earlier this year the company allowed Microsoft to finally launch Office for iPad on its tablet range. But with the introduction of HealthKit and particularly the Apple Watch, a new market segment for the company, it's probably a tad unlikely Apple will be receptive to an approach from Android Wear. As with most smartwatches time will tell.